Make yourself at home in one of the 43 guestrooms featuring minibars. Rooms have private balconies. Satellite television is provided for your entertainment. Private bathrooms with showers feature complimentary toiletries and hair dryers. This small hotel is situated directly on the beach and only 200 m from the centre of the holiday resort of Altinkum. Bars, restaurants and discos are within easy walking distance. The city of Bodrum with its airport is approximately 90 km away. Features of the hotel include 60 rooms, 24-hours reception, currency exchange, newspaper stand, TV room, outdoor pool, children's pool, playground, restaurant, 3 bars, supermarket and hairdresser. Wheelchair accessible. The centre of Altinkum is only 800 m from this accommodation complex and Izmir Airport is only 140 km away. It comprises a total of 24 family-friendly apartments, furnished and arranged in a way to guarantee an enjoyable and comfortable holiday. Facilities on offer include a lobby area where guests will find a bar and a TV lounge for relaxation and leisure. For dining options the hotel features an on-site restaurant, which serves various dishes. The complex offers an open-air pool and a children's pool as well as a poolside snack bar with sun loungers and parasols. On-site parking is available for those arriving by car. Boasting a stunning setting overlooking the spectacular Aegean Coast, this charming hotel is the ideal option for guests of all ages. Guests will find themselves in close proximity to a number of attractions and main points of interest in the area, as well as shopping opportunities, dining options and entertainment venues. The hotel welcomes guests with warm hospitality and the promise of a relaxing stay. The guest rooms are tastefully appointed, and come complete with modern amenities for added comfort and convenience. The hotel offers a range of excellent facilities, catering to the needs of every type of traveller, and ensuring a convenient, comfortable stay. 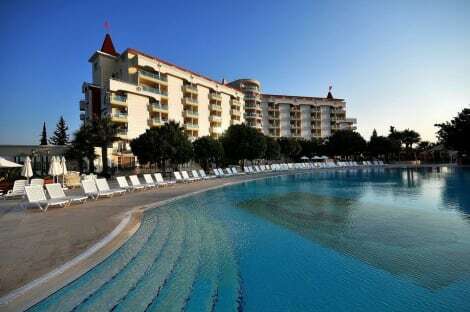 This friendly apart hotel is located only 150 m from the beautiful sandy beach in the popular holiday resort of Altinkum, the resort centre is just a few steps away. The village of Didim with its impressive Temple of Apollo is about 4 km away. The international airports of Bodrum and Izmir are at a distance of 70 km and 130 km, respectively. Nestled in a vibrant resort of Altinkum, this charming hotel is a perfect place for all those longing for a beach holiday in a stunning natural spot.Featuring a dazzling outdoor pool and a snack bar, this family-friendly property is a perfect base for a laid back, beachside holiday and guests will find a myriad cafe bars and restaurants in close vicinity. The centre of the resort and main beach are just over 1 km away and the nearest bus stop is 150m. The light-filled rooms offer tasteful décor and modern amenities to afford patrons a haven of serenity. History enthusiasts will find the spectacular Apollo Temple, dating from the times of Alexander the Great is just 5 km away while further afield there are the ancient cities of Miletus and Priene to explore. Those who look for fun-filled holiday may take advantage of a wide offer of leisure activities available nearby. Featured amenities include complimentary wired Internet access, a business center, and express check-in. Planning an event in Didim? This hotel has facilities measuring 2691 square feet (250 square meters), including conference space. A roundtrip airport shuttle is provided for a surcharge (available 24 hours), and free self parking is available onsite. Located in Didim, Temple Miletos Hotel is a 2-minute drive from Altinkum Beach and 6 minutes from Lunapark. This hotel is 2.6 mi (4.2 km) from Didim Marina and 6.6 mi (10.7 km) from Didim Aquapark. This apartment hotel is located close to the centre of Altinkum. Guests will find themselves just a short distance away from a host of attractions in the area. The nearest sandy beach lies just 250 metres from the hotel. Shops are to be found just 300 metres away. Guests will find themselves within easy walking distance of a range of restaurants and entertainment venues. This wonderful hotel enjoys a contemporary design. The guest rooms beautifully reflect the rich culture and history of the area. The hotel features a wide range of exemplary facilities and services, meeting the needs of every type of traveller to a high level of excellence. lastminute.com has a fantastic range of hotels in Didim, with everything from cheap hotels to luxurious five star accommodation available. We like to live up to our last minute name so remember you can book any one of our excellent Didim hotels up until midnight and stay the same night.